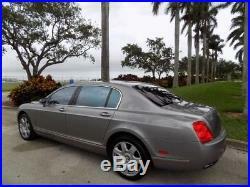 2007 Bentley Continental Flying Spur Base. Clean CARFAX BLUETOOTH NAVIGATION PUSH BUTTON START REAR VIEW CAMERA FL. Year Make Model Mileage. 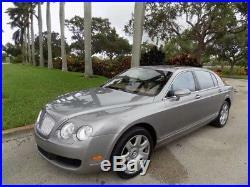 2007 Bentley Continental Flying Spur Base 80,513. Exterior Interior Stock # VIN. Arnage Range Paint BURNT OAK 78041004 SCBBR93W078041004. 6.0L DOHC 48-Valve EFI Twin-Turbocharged W12 Engine. View new window sticker. Not all accidents or other issues are reported to CARFAX. The number of owners is estimated. See the full CARFAX Report for additional information and glossary of terms. No Accidents / Damage Reported to CARFAX. No Airbag Deployment Reported to CARFAX. Vehicle Qualifies for the CARFAX Buyback Guarantee. No Structural/Frame Damage Reported to CARFAX. No Indication of an Odometer Rollback. No Total Loss Reported to CARFAX. BLUETOOTH, NAVIGATION, PUSH BUTTON START, REAR VIEW CAMERA, PARKING SENSORS, HEATED AND COOLED SEATS, Burnt Oak Leather. Come see why so many place their trust in us for high quality foreign vehicles at a great price! We are a family owned, full sales & service dealership that has been in operation for a decade. We offer nationwide financing for our customers with 550+ FICO score, with rates as low as 2.9%. Ask Dealer A Question If you have a question, please call or complete the form below for a quick response. City 10/hwy 17 (6.0L engine/6-speed auto trans). Rain-sensing intermittent windshield wipers Traditional Bentley matrix grille Dusk-sensing bi-xenon low/high-beam headlamps w/integrated washer jets Pwr sunroof w/sunshade (2006) Daytime running lights (2006) Color-keyed pwr folding heated electrochromic pwr mirrors w/integrated turn signals, memory Fog lamps (2006). Full-hide leather seating upholstery & interior trim Anti-theft alarm system (2006) Rear window defogger Engine immobilizer (2006) 4-zone auto climate control-inc: separate driver/front passenger controls & rear seat controls, micro filter, active carbon filter Pwr rear sunshade Leather/wood center console w/storage compartment Rear fold-down center armrest-inc: storage & dual cupholders Leather-wrapped tilt/telescopic steering wheel w/audio & cruise controls, memory Rear heated bench seat w/pwr lumbar support Genuine burr walnut veneer trim (2006) Front/rear cargo area 12V pwr outlets (2006) Infotainment centralized control system Cruise control Electrochromic rearview mirror Front/rear in-door map pockets Rear seat ventilation ducts. 4-wheel anti-lock braking system (ABS) Automatic load-leveling suspension (2006) Electronic Stability Program (ESP) All-wheel drive Electronic brake force distribution Traction control system 6.0L DOHC 48-valve EFI twin-turbocharged W12 engine w/variable valve timing. Front/rear stabilizer bars (2006) Compact spare tire w/steel wheel 6-speed automatic transmission w/manual shift & column-mounted shifter paddles P275/40ZR19 performance tires (2006) Speed-sensitive pwr steering Twin stainless steel oval tail pipes (2006) Pwr ventilated front/rear disc brakes Limited slip differential Brake assist 19 5-spoke painted alloy wheels. ALL STANDARDS ARE 2007 UNLESS OTHERWISE NOTED. 4-wheel anti-lock braking system (ABS) Emergency interior trunk release Front/rear head/side-curtain airbags Daytime running lights (2006) Driver/front passenger frontal airbags w/occupant sensor Child seat anchors Traction control system Front/rear 3-point seat belts w/pre-tensioners Rear child safety door locks Dual front/rear side mounted airbags. Secure Online Credit Application. Applying for a vehicle loan online is one of the quickest and easiest application methods. Our secure online application form is easy to complete, all you need are a few personal and employment details. Below are a few of the other vehicles currently available from Taverna Collection. Welcome to The Taverna Collection. The Taverna Collection is a family owned and operated dealership located at 2060 Tigertail Boulevard Suite G, Dania Beach, FL 33004. We specialize in procuring the finest pre-owned vehicles across all manufacturers and price ranges. Once a vehicle arrives at our facility, it is inspected with a fine-tooth comb to repair any small issues. We offer financing with our various partner banks including Gateway One Financial, GM Financial AmeriCredit, Westlake Financial, and others – If your FICO score is above 500, we can usually get you approved! We offer comprehensive warranties from Wells Fargo which even cover wear and tear items like seals and gaskets, and give you a free loaner car when your vehicle is at the dealership for service! We are well-versed in the export procedure, especially to Canada. We can export any vehicle worldwide at a very affordable cost, directly to your door. We are a used car dealer proud to serve Miami. And West Palm Beach. The Taverna Collection is a Florida Dealer operating under Florida License number 1023806. The Taverna Collection is located at 2060 Tigertail Boulevard Suite B, Dania Beach, FL 33004. Although we describe all our vehicles to the best of our abilities, it is still possible that we may have unintentionally made an error or left some information out. Please keep in mind that used vehicles may have typical dings and scratches inherent for their year and mileage. 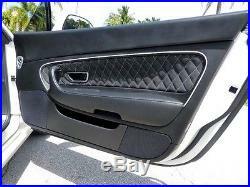 Interior wear should also be considered depending on the vehicles year and mileage. Since these are used vehicles, please remember that books, keys, floor mats, CD Cartridges, Navigation Discs, etc. We are not responsible for errors or omissions in our listings. We are not the first owners of this vehicle and therefore cannot guarantee history, condition, reliability, mileage, title, salvage/history of salvage, function or performance of the vehicle. Manufacturers warranties may still apply. Choice of Law & Forum. If funds are not received, and an alternate arrangement has not been made, the vehicle can and will be made available to other potential buyers on a first-come, first-serve basis. We have disclosed as much information as possible about this vehicle and aim to only carry quality pre-owned merchandise. The Taverna Collection recommends all vehicles be inspected BEFORE leaving our facility. The Taverna Collection values your business! We aim to recommend only quality vendors. The Taverna Collection accepts cashiers checks, certified funds, or verified drafts from known/approved financial institutions. In their own states. All cars come with one master key unless otherwise stated. Vehicles come with books and/or manuals only if pictured in photo gallery and/or if stated in the ad. We make every effort to present information that is accurate. However, it is based on data provided by the vehicle VIN decoding and/or other sources and therefore exact configuration, color, specifications & accessories should be used as a guide only and are not guaranteed. Under no circumstances will we be liable for any inaccuracies, claims or losses of any nature. Furthermore, inventory is subject to prior sale and prices are subject to change without notice. Ad created by DealerSocket Inventory+. 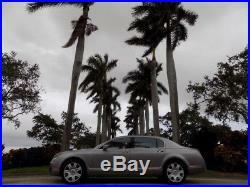 The item “2007 Bentley Continental Flying Spur” is in sale since Sunday, June 10, 2018. 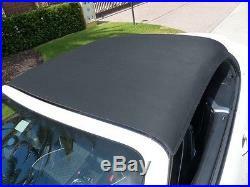 This item is in the category “eBay Motors\Cars & Trucks\Bentley\Continental Flying Spur”. 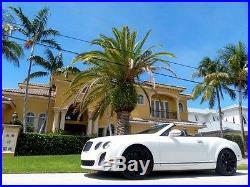 The seller is “thetavernacollection” and is located in Dania, Florida. This item can be shipped worldwide. 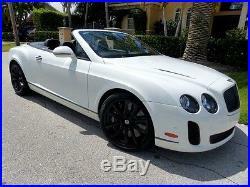 2012 Bentley Continental Supersports Supersports. Supersports Carbon Ceramics Rearview Camera Comfort Seats 20 Supersports Wheels. Year Make Model Mileage. 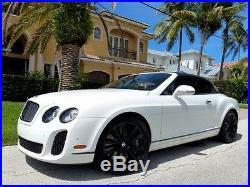 2012 Bentley Continental Supersports Supersports 26,301. Exterior Interior Stock # VIN. Glacier White Solid Black JC SCBDU3ZA3CC072982. 6.0L DOHC 48-Valve EFI Twin-Turbocharged W12 FFV Engine. Not all accidents or other issues are reported to CARFAX. The number of owners is estimated. See the full CARFAX Report for additional information and glossary of terms. Vehicle Qualifies for the CARFAX Buyback Guarantee. No Structural/Frame Damage Reported to CARFAX. No Indication of an Odometer Rollback. No Total Loss Reported to CARFAX. 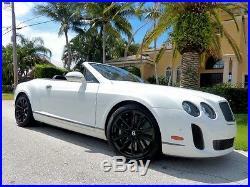 Having a HARD TIME Finding The Right Deal on a Low-Mileage 2012 Bentley Continental Supersports. Only 26,301 Documented Miles. 28 HIGH RESOLUTION Photos, Vehicle History Report, Video and Original Options List on File. Complete The INFO REQUEST FORM On The Bottom and Request Them. THE COMPLETE OPTIONS LIST INCLUDES Carbon Ceramic Brakes Rearview Camera 20 Ten Spoke Supersport Wheel Special Embroidery on Seats Valet Key Comfort Seats Power Trunk Glacier White Solid Black Brake Calipers White Interior Piping and Stitching This Bentley is powered by a 6.0-liter twin turbocharged W12 that is massaged and boosted to develop 621 horsepower and 590 pound-feet of torque. The sleek two-door is masterfully engineered and beautifully styled. This is one of the fastest convertible is the world today. If you are looking for set yourself apart from everyone else on the road this Supersports Convertible will do so. Carfax Shows the vehicle was involved in an accident. It’s Next Owner is in for a Treat. 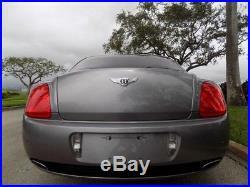 Lifetime Wholesale is Pleased to Offer Current Availability of This 2012 Bentley Continental Supersports. Complete The INFO REQUEST FORM On The Bottom and Request A Vehicle History Report The Video and The Original Options List Now. Visit us on Federal Highway in Pompano Beach, Florida. With Almost 40 Years Of Serving Customers Automobile Needs, Come Experience Why Lifetime Wholesale Is South Floridas Premier Luxury And Exotic Car Dealer. Lifetime Wholesale Brett Casoria brett. SUPERSPORTS EMBROIDERY ON FRONT. 20 10-SPOKE DARK-TINTED SUPERSPORTS WHEELS. IPod interface -inc: iPod & USB connection DVD based navigation Bluetooth telephone system w/remote SIM access profile Infotainment centralized control system. Tire inflation/repair kit Fixed rear spoiler 20 10-spoke smoked steel finish aluminum wheels Color-keyed pwr folding heated electrochromic mirrors w/memory Rain-sensing windshield wipers Performance tires Unique supersports tailpipe trim Smoked steel finished headlight bezels, lower bumper & radiator grille, window & door surrounds LED tail-lights Dual hood vents w/smoked steel grille finish Front bumper w/large vertical lower air intakes Bi-xenon headlights w/integrated washer jets -inc: black casings, smoked steel bezels. Diamond quilted Alcantara door panels 3-spoke single-tone leather multi-function sports steering wheel w/soft grip leather, brushed silver switch surround Steering wheel knurled chrome gear shifters. Rear bucket seats Cruise control Center armrest w/storage Beluga floor mats w/leather binding Electronic parking brake Alcantara headliner Leather-trimmed front bucket seats w/diamond quilted Alcantara seat faces & manual seat adjustment Pwr windows Auto climate control Electrochromic rearview mirror Carbon fiber Supersports treadplates Rear window defogger Keyless entry & ignition w/engine start/stop button Drilled alloy sport foot-pedals Carbon fiber finished fascia & centre console Rear compartment w/luggage rails & carbon fiber cross beam Pwr tilt steering wheel w/cruise control Remote controlled garage door opener. Advanced torsen limited slip differentials. All-wheel drive Pwr steering 6-speed automatic transmission w/semi-manual mode Carbon ceramic brakes 6.0L DOHC 48-valve EFI twin-turbocharged W12 FFV engine w/variable valve timing Front & rear floating caliper disc brakes Lowered sport suspension Front & rear independent air suspension. Front & rear side curtain airbags 4-wheel antilock braking system (ABS) Electronic stability program (ESP) Electronic brake force distribution (EBD) Park distance control graphic on infotainment screen w/audible warning Tire pressure monitor Front & rear side mounted airbags Driver & front passenger frontal airbags w/occupant sensors. Other vehicles currently available from Lifetime Wholesale. All funds must be in US dollars only. We assume no responsibility for damages incurred after leaving our premises. Every effort has been made to accurately and fairly describe this vehicle to you. Please be advised that used vehicles will have typical scratches and dings inherent for their year and mechanical parts are subject to fail. Ad created by DealerSocket Inventory+. The item “Bentley Continental GT Supersports” is in sale since Wednesday, August 17, 2016. 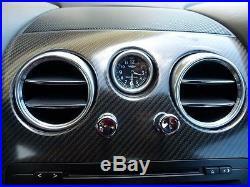 This item is in the category “eBay Motors\Cars & Trucks\Bentley\Continental GT”. 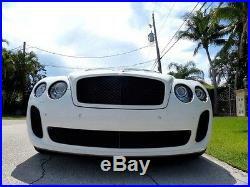 The seller is “lifetimewholesale” and is located in Pompano Beach, Florida. This item can be shipped worldwide.